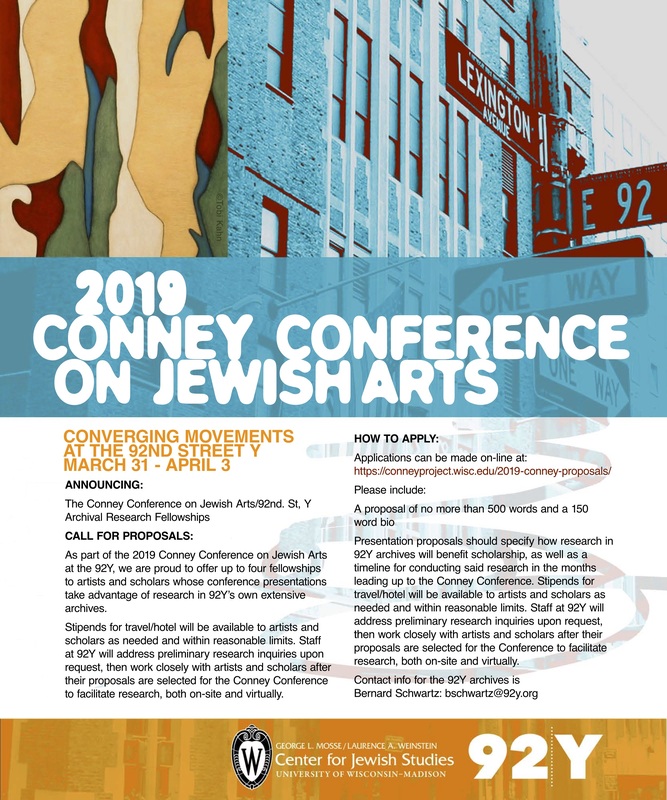 As part of the 2019 Conney Conference on Jewish Arts at the 92Y, we are proud to offer up to four fellowships to artists and scholars whose conference presentations take advantage of research in 92Y’s own extensive archives. Stipends for travel/hotel will be available to artists and scholars as needed and within reasonable limits. Staff at 92Y will address preliminary research inquiries upon request, then work closely with artists and scholars after their proposals are selected for the Conney Conference to facilitate research, both on-site and virtually. Presentation proposals should specify how research in 92Y archives will benefit scholarship, as well as a timeline for conducting said research in the months leading up to the Conney Conference. Stipends for travel/hotel will be available to artists and scholars as needed and within reasonable limits. Staff at 92Y will address preliminary research inquiries upon request, then work closely with artists and scholars after their proposals are selected for the Conference to facilitate research, both on-site and virtually. Please include a short 150 world bio, a 100 word abstract of your proposal, and a proposal of no more than 500 words. PLEASE SUBMIT PAPERS AND PROPOSALS BY DECEMBER 21 by clicking the button below. For further information, please contact contact Douglas Rosenberg, rosend@education.wisc.edu.